Here I sit, once again. Trying to wrap my head around the headlines and my heart around the chaos. Around the death and destruction and terror--and the senselessness of it all. Because life is hard enough. Bad things happen naturally. Without the aid or assistance of mad men, bent on wreaking more havoc, causing more heartache. Mad men whose aim is to create terror. Oh, the media can shy away from that word "terrorism," in a poor attempt to be politically correct or to avoid jumping to conclusions. But, let's be clear here. Any person or persons who build a bomb with an intent to cause harm to innocent people in a public setting surrounding a high profile event obviously intend to create fear and to evoke terror. Foreign or domestic--it doesn't matter. The depraved and sick minds who thought this up and completed their sinister plan are terrorists. And, here we sit. Once again. Riveted by the images, aghast at the details of the lives lost, the people injured, the heroes who stepped in, the eyewitnesses. This morning, I sat to watch the news about this for the first time. 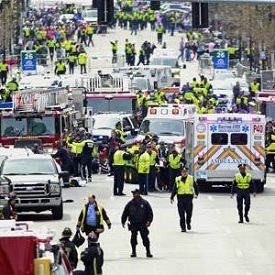 My heart nearly burst when I heard how families of victims from Newton, Connecticut, were sitting in the stands at the finish line as guests of honor. Families who've survived the unthinkable. And had a front row seat to an encore of such insanity. It's just too much. It just feels like too much. How much more can one person take? How much carnage can one person survive? These questions plagued my mind as I saw the footage of Iraqi war veterans in full uniform helping the bomb victims. Only this time, it wasn't on foreign soil in the middle of a war. It was in their own homeland where they expected to be safe, in the middle of an unofficial and ongoing war against terror. The terror that leads news anchors to ask such questions as how do we explain this to our children? What "new normal" will this event usher in, in a post 9/11 era where security is already heightened? Who did this and why? And experts are brought in to attempt to answer these questions. To attempt to help us all, as Americans and global citizens, know how to deal with the fear this sparks when we consider going about our daily business where the unthinkable could happen. News flash, folks. God's Word makes it clear. However clever they think themselves to be, modern day terrorists are not inventive. They are simply repeating the same old tired plot of terrorists of old. Insane and ruthless leaders such as Pharaoh or Herod or Nero. Who killed innocent babies to control the Israelites with the age old tactic of fear. We think ourselves in some crazy new age of terror. But the truth is, it's always been a part of history. It's part of the fallen world we live in. Fear paralyzes us. It stops us in our tracks. Makes us rethink something as simple as training for a marathon. Or sending our children to public schools. It keeps us up at night and captures our minds, holding us hostage. Fear is an age old foe. And, we, as all people throughout history, have a strong battle cry to offer in fear's face. We, as all who have come before and all who come after us, have a promise to stand on that should embolden us and empower us to walk forward and press on past fear. The Israelites stood where we do today. They were surrounded by an enemy. A ruthless enemy. They were terrified and afraid and it caused them to feel a bit irrational as the fear that overcame them. As Pharaoh approached, the Israelites looked up, and there were the Egyptians, marching after them. They were terrified and cried out to the Lord. We sit and realize that terror has crept into our comfort zones, within the context of a noble pursuit of fitness and athleticism. We see the results, the flashing images and we hear the eyewitness testimonials. And a cold fear creeps into our hearts and we feel terrified and cry out to the Lord. How could this happen? Where were YOU, God? They said to Moses, "Was it because there were no graves in Egypt that you brought us to the desert to die? What have you done to us by bringing us out of Egypt? Didn't we say to you in Egypt, 'Leave us alone; let us serve the Egyptians'? It would have been better for us to serve the Egyptians than to die in the desert!" We sit and partake in an ongoing national debate about which president should have done what to whom at which time in order to avoid this terror. Why did we go to war? Why did we pull out of war? What is wrong with our foreign policy? What was wrong with the security? We point fingers and we cry out and moan and groan, placing blame all around. In the midst of all this, we are so like the Israelites. Do we not see from the above passage how they became distracted from the REAL enemy? The Egyptians? We, too, can so easily get sucked into the distraction of fear, which takes our eyes off of our real enemy. Moses answered the people, "Do not be afraid. Stand firm and you will see the deliverance the Lord will bring you today. The Egyptians you see today you will never see again. YOU NEED ONLY TO BE STILL." As we experience this terror, which is nothing new under the sun, let us remember and dwell on the freeing words of old. Let us lean in and listen and really hear what Moses is telling US--you and me. Do not be afraid. Stand firm. Wait for the deliverance the Lord will bring. The terrorists you see today you will never see again. Our job is only to be still. Let God fight our battles. Indeed...there is a promise on which to stand firm. Our real enemy is behind these terrorists. The one who seeks to kill, steal and destroy. The one who prowls around like a lion, waiting to devour. But, let us all remember the end of the story. Let us all remember who wins in the end. Let us all be encouraged to know that victory is God's alone. Let us all remember that when Christ died on the cross, the power of death and sin was conquered, once and for all. Oh, yes, in this world we will have troubles. In this world, we will struggle. In this world, the enemy casts his chains and shackles of fear in order to bind us up and keep us from running. To stop us from running the good race. To distract us from pushing on and running hard and believing that God is still on His throne. He wants us to forget the promise that if we resist the devil, he will flee (James 4:7). He wants us to be so wrapped in fear and lost in the chaos of the moment that we forget to stand on the Word and remember any one of the 365 verses the Bible contains about not having fear. One for each day of the year, I've heard it said. Powerful promises that put fear in its place. Powerless before a Mighty God. And, so today, I pray to encourage you with this truth. This world indeed has troubles. Bad things happen. Ruthless men plot. And they think they succeed. But the ultimate victory at the end of time belongs to our Heavenly Father alone. Eternity cannot be taken from us once we place ourselves in His hands. I'm testifying today to God's grace. Grace that paid the price so that sin and fear and death would not win in the end. Grace that covers all fear. Grace that unlocks the shackles of fear. Grace that fights for me, delivering me from all evil. Grace that presses me to run my race daily, taking on the tasks He gives so that His grace is evident to all. Grace that can whisper hope into the darkest of pits and light a spark to keep going. Grace that bands us together to soldier on and not be defeated by what comes our way. Grace that reminds us that the finish line is not the grave. But, the eternity to come. Amazing grace.